﻿﻿﻿We used whatever we could; rakes, barrows, pitch forks, kayaks, paddle-boards, surfboards... but it was the sheer determination and commitment from around 25 Landcarers and community members that has seen the world’s worst aquatic weed removed from Lake Ainsworth - well, for the time being anyway. It was about an hour into our first Water Hyacinth working bee, when we realised that we’d probably bitten off more than we could chew! Either ﻿﻿this monster weed had doubled in size since we made our initial plans (quite possible) or we’d been overly optimistic in the assessment of our weed pulling abilities (also quite possible). Once we started though, there was no turning back - we organised a second urgent working bee and were also assisted by numerous individuals who volunteered their time over the easter holiday period. ﻿﻿We’re now pleased to report that after two weeks of intensive efforts, for the moment, Water Hyacinth is out of our much loved lake and has been carefully carted away by Council staff. In the coming months we’ll be keeping a close eye out for any new infestations in the Lake, as we expect that this is not the last we’ll see of it. Actions often speak louder than words - and in this case it appears that our town’s little treasure holds a special place in the hearts of many. To those of you who kindly helped out we say thank you! If you would like to help out with Water Hyacinth monitoring or removal in the future please contact us by emailing lennoxheadlandcare@gmail.com or by phoning Shaun on 0448 221 210. 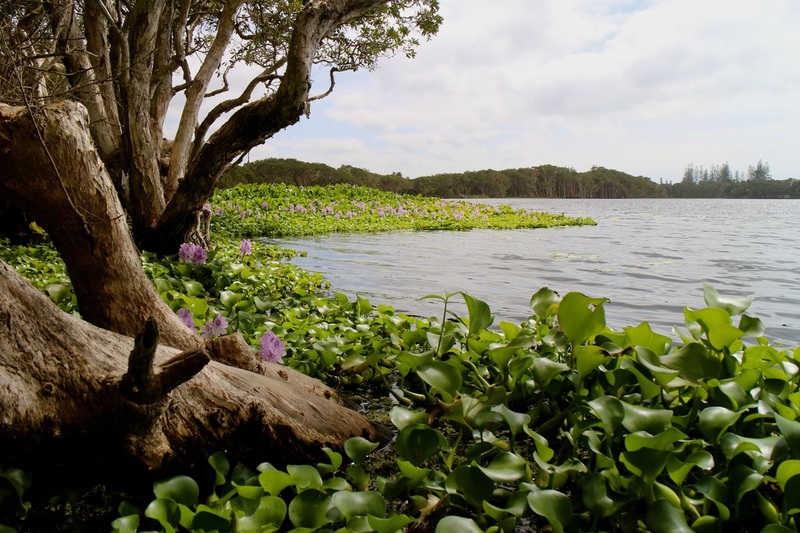 ﻿Water Hyacinth is known as ‘the world's WORST aquatic weed’, and up until recently Lake Ainsworth has been spared from the impacts of this insidious yet beautiful species. A declared noxious weed, Water Hyacinth is capable of covering whole water bodies in a very short amount of time. In ideal conditions which are slow moving and nutrient rich waters, like Lake Ainsworth, it can double in size every 5 days. It does this by producing daughter plants from horizontal stolons. It further ensures its survival by releasing an enormous amount of seed - up to 3000 seeds per flower spike, these seeds can then remain viable in soil for 20-30 years﻿. Small infestations of Water Hyacinth were first noticed on the western edge of Lake Ainsworth towards the end of summer. These infestations have grew rapidly - into a sizable mass. New small infestations were also emerging around the lake’s remaining edges. The most likely explanation for how this weed got into Lake Ainsworth is from seeds which were hidden in the mud on someone's shoes, kayak, boating equipment or fishing gear.